Coding on the game is fun, doing game design is fun, but coding boring tools to create content isn’t. So I usually switch between those three things on the fly, so that the boring part of creating tools doesn’t overweight the fun of doing the creative stuff for my current project. 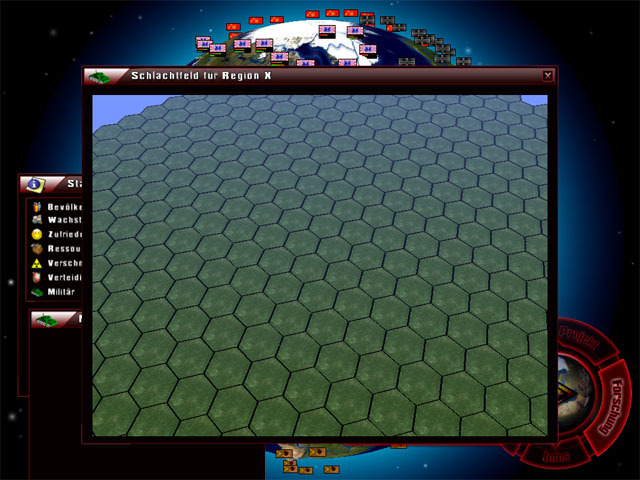 And therefore, after coding some hours on “WeltEdit”, the editor to create all content for my current project I went on to implement the three-dimensional hex battlefield into the game, and now have it up and running in it’s own window, nicely implemented into the GUI. Now I “only” need to fill it with the military units that’ll be in the final game and some additional environmental stuff (the shots in an earlier post were from an external test-application, so the models shown there won’t make it into the final game). Since I already have created the datasets for the military units in the above mentioned editor, next would be to create the 3D-Models for the units. But that’s usually pretty fun, so I’m kinda looking forward to do some 3D-modelling again (it has been quite some time since I made my last object in a 3D-modeller). On the game design front, I started making a list of the buildings that the player can build in a region. And I must admit that it’s a really interesting part of the game design, cause it’s not just something like “this kind of building sounds nice, so add it to the list” but you rather have to think “this building could be interesting for the player to build and now also give it values so that he really wants to build it in the game”. I’ve already created some strategic games where the player was able to have buildings, but I never really thought about the strategic aspect of the buildings back then like I did today when creating that last. Back then I just added buildings that could be of interest and didn’t really take time to balance them. But this time it’s different. So first I made different categories for buildings and each categorie will have a different number of buildings. But all the buildings inside a category have their goods and bads so there will be a building that e.g. improve your population growth by a huge amount and a similar building that’ll only improve it by a smaller amount, but that also won’t cause as much pollution as the first one. So in the end the player will always have to weighten the positives and the negatives of each building before he builds it, which makes building much more strategic than in my games before. And to make it even more interesting, the number of buildings a player can have per region will be limited to a rather small amount (maybe 10, but I also think that I’ll even lower this, but that’s something I have to try out when playtesting), so that it’s of even more strategic value which buildings to have in a region.